The world is in trouble, and it’s up to us to save it from, well, us. CO2: Second Chance is the latest release from heavy euro designer legend, Vital Lacerda. In it, your group must build green power plants to power the earth in the cleanest way possible and minimize CO2 emissions. What you have to decide is whether it will be a team effort or a race to see who can do this the best. 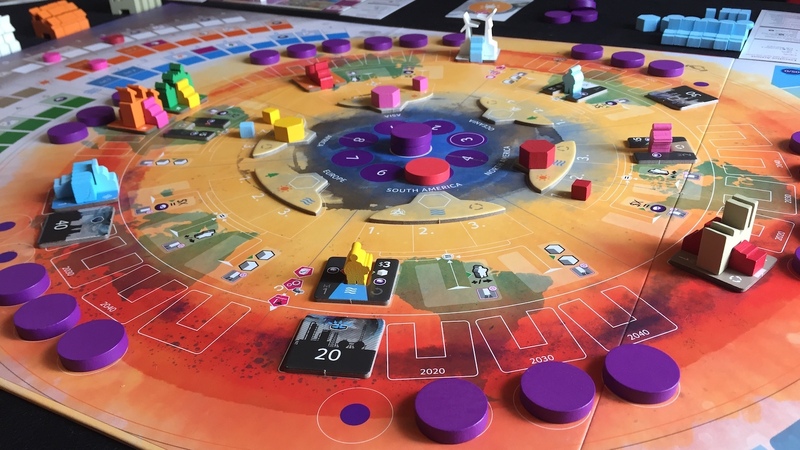 CO2: Second Chance is a 1-4 player game that is either cooperative, or semi-cooperative, the former of which is the biggest change from the previous title, CO2. The game board has two sides; Both sides have many similarities, but feature different mechanics depending on your choice. The semi-cooperative side is truest to the original title. You are all trying to win the game and benefit most from building green power plants in specific locations, but if everyone as a group lets the CO2 level rise too high, the entire world perishes, and everyone loses. In the co-op mode, there are no personal victory points, but rather an accumulated VP level that gets eaten away by any sort of failure. Should your VP go below zero by the end of the round, or the CO2 rise too high, everyone loses. To win, simply survive through 4 decades without this happening. The cooperative mode is what sets this game apart from its predecessor, and mostly on what this review will be focused. When opening the box, you get what we have come to anticipate from Lacerda’s trademark complicated and difficult to master (or “heavy”) games. The game includes a large 2-sided board, tons of wooden pieces expected in a euro game such as multicolored specialized meeples, cubes, and discs. Wooden pieces not typical to this type of game include large power plant pieces specific to their green energy types, and building infrastructure pieces for each player. Also included are several objective tiles, and many cards of various sizes. Just setting these all up on your first go lets you know that this game is going to give you a lot to think about. How you play in either mode corresponds to your player mat. During every turn, a player must take a main action (propose a project, prepare infrastructure, or build a power plant), and may take any or all of the executive actions (move a scientist, visit the Carbon Emissions Permit (CEP) market, or take a lobbyist or UN card action. Players can propose power plants to get things started. By moving their scientists around, players can gain knowledge in various types of green energy: The more proposed sites they visit, the more knowledge they gain. They can then send the scientists to other proposed sites, or energy summits to talk about what they’ve learned, ultimately gaining even more knowledge. Players can then build infrastructure on these proposed sites, and then different types of green power plants on those sites. The more successful they are in doing this, the less penalties the players take for the spots they missed that have to use fossil fuel for their energy needs. Objective tiles that are randomly chosen at the beginning of the game represent achievements the players need to reach, or they will be penalized for that at the end of the decade for this as well. This penalty is 1 VP for each not achieved at the end of the first decade, but goes to 2 at the end of the second and so on. On top of all that, there are goals the UN has given for the players represented by cards just off of the board. In order to succeed, the players must reach almost all of these goals (which vary according to player count). Players are each given a hand of 5 Lobbyist cards to aid them in this gigantic task, and must use them wisely, as they never replenish their hands. This can be difficult to do well if you really stick to the rules, as you are never allowed to speak to the other players about what your personal lobbyist cards are or what they do until you play them. Vital Lacerda is a master of his craft, and this game is no exception. As always, he expects attention paid to many spots all over the information-heavy board. A well-played turn will set off a chain reaction and help your team greatly, while a hasty one will waste time and maybe lose the game for you and your team. Like any good Cooperative game, it is very difficult to escape victorious, and players should be ok with many attempts and a general sense of doom hanging over their heads. On the other side of the board there is a bit of backstabbing and letting others fail, but with that same sense of doom if players don’t play nice even a little. CO2: Second Chance looks beautiful, with an all-new color scheme since the last version, but one can’t help but criticize the game a little for some of the quality of the production. There are a few spelling errors on the box itself (“compeditive” “knowdledge” and “player markes”), and the player aids meant to fit perfectly with the player mat to explain everything ignore all color schemes, are on cheap paper, and are longer than the player mat itself. The player mats could use indents for the wooden pieces on them, but generally do well to inform the player of his or her options, just don’t bump the table. Do any of these things prevent one from having a good time? No, the game is still great, but after waiting a very long time for the kickstarter game to show, and expecting it to live up to the quality of some of his previous titles such as Lisboa, I was a little disappointed. Overall, fans will be pleased when playing the amazingly heavy CO2: Second Chance, and once they get over the quality issues, will only be hindered by the problem all Lacerda’s games give them… finding people patient enough to learn such a complicated (but satisfying) game. Nick Cvercko is a 37 year old fella from Flagstaff Arizona that lives with his wife and pets in Austin TX. You can find him at Lamberts Downtown BBQ mixing up all the tasty drinks. He may be a little too in to board games.